George Balderose, a piper with more than forty years of performing experience, plays and teaches Scottish and Irish pipe music on the Great Highland Bagpipe and various types of smallpipes. George also performs regularly with the ensemble Road to the Isles and as a soloist with champion Scottish and Irish dancers. During the 1990's he performed as a soloist at the Metropolitan Museum of Art in New York City, at the Carnegie Music Hall in Pittsburgh, and three times as a guest artist in concert with the Pittsburgh Symphony at Heinz Hall. He has also appeared in concert with Tom Chapin and John McCutcheon, The River City Brass Band, ‘Brigadoon’ with the Pittsburgh Civic Light Opera, and others. A New York Times reviewer described George as having a "virtuoso's gift" and in the words of another he is a "virtuosic piper". Since 1975 he has performed at numerous concerts, festivals, and many other occasions. His piping has been recorded on H.K. Hilner's Dream Cathedral, Dewar's Bagpipe Festival at the Knitting Factory, Road to the Isles’ The Way Home, A Celtic Christmas on the KRB label, and Bagpipe Music Selections: Great Highland Pipes and Smallpipes. In addition, George performed for a DVD recording of the piobaireachd The Lament for the Children accompanied by organ, choir, and interpretive dance, and has written various articles for piping publications. 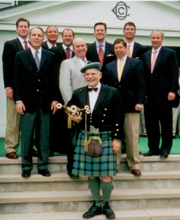 In 1978 George founded and continues to instruct and serve as Executive Director of the Balmoral Schools of Highland Piping, a non-profit corporation that produces educational sessions each summer at four to five Universities across the USA and which each year serves over 200 students. In 1980 the Clan Donald Educational and Charitable Trust awarded George a fellowship to travel to Scotland and study with master piper James McIntosh, M.B.E. A long-time student of James McIntosh, George has produced three audio recordings and an instructional video of his mentor's playing. In 1981 George was awarded the Senior Certificate in Piping from the College of Piping in Glasgow, Scotland. Currently George serves as a Trustee of the Clan Donald Educational and Charitable Trust, a non-profit foundation that awards scholarships for Americans to study as Scottish universities. 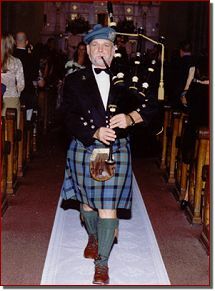 In 1984 George founded, directed, and served as piping instructor for Scottish week at the Augusta Heritage Center in Elkins, WV. Since 1989 he has been a member of the Pennsylvania Governor's Heritage Affairs Commission's Traditional and Ethnic Arts Touring Program. George can send prospective wedding clients a demo CD he recorded of 'Bagpipe Music for Weddings', and for funeral clients a list of more than 50 hymns and airs he plays on the pipes. In 2012 he published 'The Balmoral Collection of Hymns Arranged for the Highland Bagpipe' which contains over 100 hymns and airs.